With today’s victory, AZUBU’s chances at advancing to the playoffs just got much higher. How doyou feel? Sleep: Today’s match was really important. I’ve been doing really badly lately so I am glad that I was able to win in such an important match like today’s. If we do get to qualify for the playoffs, then I will work perform even harder than I did today. Symbol: I’ve failed to come through for a lot of games throughout this season but I was sent out again because the supervisor believed in me. I am glad that I was able to put on an ace material performance, and I will make sure we win vs MVP next week no matter what. Your first ever official GOMtv victory ever since becoming a pro gamer. Sleep: I didn’t have a lot of chances to advance to any regular leagues because I kept getting eliminated during the qualifiers. I was struggling a lot all this time because I was weak at ZvZ. I’ve been getting a lot of chances to get sent out for official matches for GSTL ever since joining AZUBU, so I think my career is just beginning. I am going to work hard so that I can win a lot more from here on out. Were you scheduled to get sent out today? How did you prepare for today’s match? Sleep: I was scheduled to go beforehand. FXO sent out Leenock for game one so I had a feeling that FXO didn’t have any more Zerg cards in their deck. So I prepared for ZvTs and ZvPs. I pretty prepared only one build order for ZvZs. Honestly, I was feeling pressured internally because I was sent out for a ZvZ, but I was sure of my build order so I think that’s why the end result was good. You lost to Hurricane and failed to grab more than one victory. Sleep: I was expecting Hurricane to go for a macro game but then I got this feeling that he was going go for an all-in as soon as the game started. So I focused on defense because I wanted to block his attack, and I even managed to grab his sentries so I told myself that I probably could win this. But then I was so focused on defending my 6’o clock expansion, that I wasn’t able to prevent his archons from killing my drones, so I lost strength. I thought I was going to win but I let me guard down so I ended up losing. It was really disappointing. You stated during the last OSL that you were having back problems. Symbol: It still hurts a little right now. I did get some treatment but it didn’t heal right away. I really can’t play a lot of games right now. I think I’m going to have to consistently see the doctor from here on out. My back is really important. You were sent out for an important match even though you were in pain. Weren’t you worried or feeling pressured? Symbol: It was a situation where I absolutely had to do something so I just sucked it up. I put on a medical patch so I told myself that I could at the very least, handle two games. I worked really hard to make sure I could handle the pain and not focus on it so much. You met Hurricane for game six on Red City. It seems like you’ve been looking weak for ZvP lately. Symbol: I had anticipated Hurricane to play the certain style that he did today. My ZvP results as of late have not been the best. I’ve been playing badly all this time and I also lost games way too easily. I think he probably expected to win easily if he harassed me as he progressed into a macro game. You faced sC for the final game. FXO could also have sent out GuMiho. Symbol: The race is what’s important. I don’t think the player really matters. 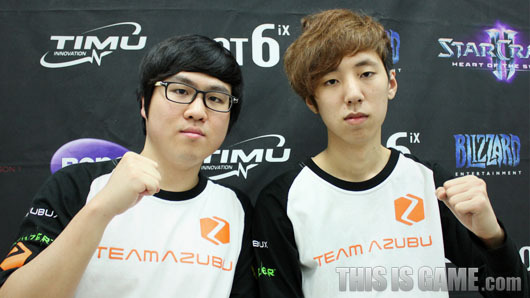 I knew what style they would be going for regardless of if I faced GuMiho or sC. sC uses an aggressive style so I worked hard on making sure I could focus on defending in order to create an advantageous situation for myself. I defended as best as I could with my roaches as I focused on scouting around with my overlords. MVP is ranked one right now. How do you think that match will go? Sleep: I think I’m going to have to prepare right away starting today. They are a difficult opponent. Even if we do win, I think that it will probably go all the way to the last game. Symbol: I also think that the match against MVP will go all the way to the final game. I think MVP is really strong vs Zergs and Protosses. I am confident for ZvZ but MVP has Super in their Protoss lineup and he is really good. Our team is going to have to be conscious of Super’s presence. I have this feeling that I’m going to get sent out vs Super. Symbol: I haven’t been doing well as of late so I was a little burdened by the fact that I got sent out today. But I am relieved because I don’t think my performance was that embarrassing. I will make sure I show much cleaner performances and a good form so I hope a lot of people will cheer for me. Sleep: I finally secured my first victory. I will work hard so that I can win more games from here on out. I will even harder so that I will be able to secure multiple kills next time. Lastly, I wish Genius hyung would stop playing LoL and start practicing a lot. And thanks Seeker for the interview. lol at the Genius hyung comment, thanks! I really hope AZUBU advances regardless of the rumors surrounding them, I was worried for them because San is in Taiwan playing for TeSL. Thanks for the interviews Slasher ! "Quantity is quality by itself"
I wish Genius hyung would stop playing LoL and start practicing a lot.